MTS/M2TS－How Much Do You Know? MTS and M2TS are Sony high definition video file types, both of which are recorded by AVCHD camcorders. So it's no surprise that many popular HD camcorders, like Canon VIXIA HF200, Canon FS200, Canon VIXIA HFS100, Canon VIXIA HG21, Panasonic HDC-HS300, Panasonic HDC-HS20, Sony HDR-CX100, Sony DCR-SR47, JVC GZ-HD40, JVC GZ-HD10 etc. record videos in MTS/M2TS format. Absolutely, HD camcorders are great tools for shutterbugs to capture every special moment and beautiful scenery around their life. Unfortunately, troubles follow as well. Playing MTS/M2TS videos on Mac is a tricky task for many Mac users. Worse still, you may also fail to upload your MTS/M2TS files to the websites when you want to share the sweet video memories with your friends and family. In order to play your camcorder recorded MTS M2TS videos on Mac without limits, a professional yet easy-to-practice free MTS/M2TS converter for Mac named MacX Video Converter Free Edition is shared to Mac users. It helps you free convert MTS M2TS to Mac accepted video format like MP4 MOV M4V so as to play MTS/M2TS files on MacBook Pro/Air, iMac 4K/5K with no video format issues. All in all, this excellent AVCHD to Mac converter is also known as free Mac video converter, supporting free video conversion between HD and SD videos on Mac with no adware or spyware. You are totally free to convert from format to format, for example, AVI to MP4, VOB to MP4, MTS/M2TS to MOV for playing on Mac, PC, iPhone, iPad etc. Step 1: Load MTS/M2TS Files. After free download the free MTS/M2TS player Mac and run it, click "Add File" to load your MTS/M2TS files. Step 2: Select Output Format. Select the output format you desire. 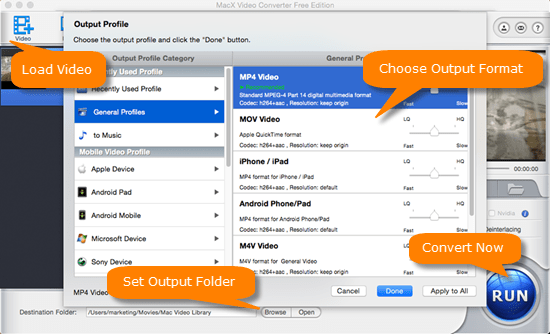 You can choose to convert MTS/M2TS to MOV, MP4 or any Mac accepted video format. What's more, the default optimized video settings make the output video looks great on your player. Step 3: Select Output Folder. Specify output folder on your computer to save the output files. Click the "Browse" button to choose the path where you want to save the output files in. Step 4: Start Conversion. After finish the above steps, click the "RUN" button to start converting MTS/TS to MP4 Mac supported format, you could view the conversion progress and are able to cancel the converting process at anytime. If you have installed several meida players like VLC, 5KPlayer etc. on your Mac other than Quicktime, you can play MTS/M2TS files directly. There is nothing too much to say about VLC, since it's worldwide popular. We'd like to introduce the emerging HD video player - 5KPlayer. It's a 100% clean and free MTS player for Mac (El Capitan/Sierra), which can play camcorder recorded MTS/ M2TS videos directly and smoothly on Mac/PC. Users don't need to download and install additional codecs or plugins. Step 2: load AVCHD video(s) by dragging & dropping or clicking "Video" option in the main interface. Then, you just need to sit back and enjoy the AVCHD MTS M2TS videos playing on your Mac without any glitches. Though you can directly play M2TS MTS videos on Mac with some other players, we still suggest you to free convert MTS/M2TS for playing on Mac. That's because playing back AVCHD video directly upon your Mac comes to be a hard job for your computer's CPU and graphics card; AVCHD recorded videos are usually in big size, resolution over 1920*1080; and even some camcorder recordings are recorded in interlaced scanning, causing the image you see from AVCHD video will not be true to the original. But if you ultilze the free MacX Video Converter to free convert MTS/M2TS on Mac, you will enjoy a better video effect on your Macbook Pro/Air, Mac mini, iMac 5K etc. 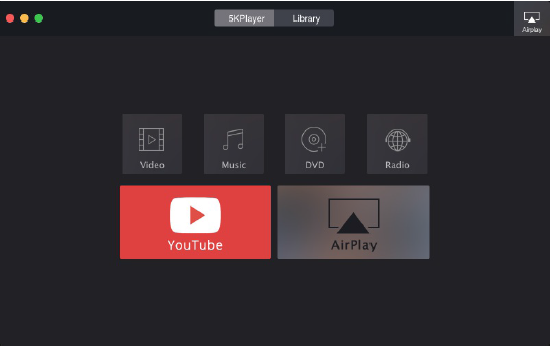 Free download the free MTS M2TS video converter - MacX Video Converter Free to easily and fast convert AVCHD MTS M2TS to MOV MP4 with high quality reserved for limitelessly playbacvk on Macbook Pro/Air, Mac mini, iMac 5K Retina etc.